Viberti had already been known for the production of commercial vehicles in 1956, enters the world of motorcycles with the Vivi moped with 50 cc and offered it at a much lower price than those other mopeds on the market then. The launch took place at the Milan Bicycle and Motorcycle show but all the other exhibitors, but without success, demanding the exclusion from the event claiming that the aggressive low pricing was a maneuver by the Fiat group, owner of Viberti, would damage the motorcycle market. The launch of the moped Loud was accompanied by a huge advertising campaign and purchase terms that were very favorable to resellers. Despite everything, the results of the sales were not sensational. 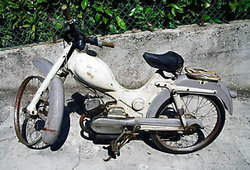 The moped Loud had a sheet printed open frame, front fork had damper biscuits and a rear swing arm with telescopic shock absorbers. Beside the the Loud there was the Turismo model , which was even cheaper, and the Live Sport scooter with side plates and a sheet metal body. The engine used was the Victoria M51 two-stroke with two-speed gear and a speed of over 55 km/h. The various models remained unchanged the following year. Not until 1960 did they presented various new versions of the Live motorbike, but the goal to conquering the market was never reached.